From the beginning, education in physics at MIT was meant to be a union of the theoretical and practical. 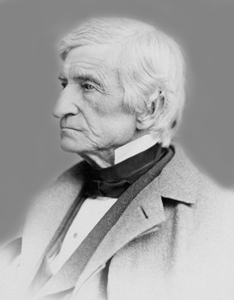 As William Barton Rogers, founder of MIT, outlined in 1861, a ideal School of Physics should endeavor "to impart a thorough knowledge of the fundamental principles of the several branches of physics, as mathematically and experimentally demonstrated; and then to conduct the more strictly practical instruction, as much as possible, under the guidance of these primary truths." 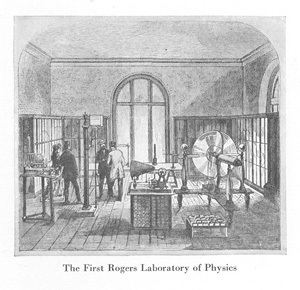 Though Rogers is today best known as a geologist, in his time he was also an accomplished practitioner of "mechanical philosophy," and deeply concerned with its role in the new institute. When Karl T. Compton became President of MIT, he embarked on an ambitious program to turn the Institute into a world-class research establishment, with physics as one of its fundamental backbones. When the Physics Department moved along with the rest of MIT to Cambridge in 1916, its strengths were primarily in teaching and in applied physics. The Eastman Court building, in which the whole of MIT was to be housed, provided a dramatic increase in new facilities and floor space, and from the period between the end of the First World War and the beginning of the Second World War the Institute boasted a six-fold increase in physics graduates. This was largely a result of the appointment of Karl T. Compton as President of the Institute in 1930. The idea of a technical institute in the 1910s and 1920s was, in general, to function as a training ground for industrial workers rather than as a front-line for new research in science and technology. In 1930, though, the Corporation approached Compton, previously chair of the Physics Department at Princeton University, to become the Institute's new President. Compton was explicitly meant to be a reformer: his appointment, he wrote was meant to be an explicit "approval of the thesis that the fundamental sciences must be made the backbone of the Institute." His timing could not have been better: it was becoming evident that the effects of the great stock market crash of 1929 were not going to be temporary, and the dangers of the Institute being too dependent on the fortunes of industry was becoming painfully clear. Harvard's John C. Slater was initially cautious about taking control of the MIT Department of Physics, but with Compton's reassurances, he decided to take the job. In a reforming spirit, Compton set out to turn MIT into a world-class research institute as well as being a world-class educational institute. One of his first efforts in this regard was to create new research facilities and to populate them with young blood. He tapped into the MIT Building Fund in order to create a $1.2 million research laboratory for Physics and Chemistry, and then began a major shake-up of the Physics Department's faculty. To head the reborn Department, Compton courted John C. Slater, a theoretical physicist then at Harvard. 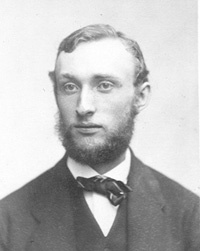 Though only twenty-nine years old, Slater was already an accomplished theorist and a participant in the development of what would become known as quantum mechanics. In his first years as an administrator, Slater was fortunate enough to have Compton's ear, and both shared the belief in the essential necessity of physics. Slater and Compton together sought to bring in a coterie of up-and-coming physicists to MIT to reconstitute the existing department. 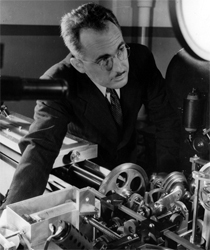 George R. Harrison, pictured here with his 'automatic comparator,' which allowed for the wholesale measurement of spectral wavelengths at much higher speeds than had previously been accomplished. Among their new hires, the Department recruited George R. Harrison from Stanford to head up the new George Eastman Laboratory. Harrison's own research was in spectroscopy -- the identification and analysis of chemical substances through their spectral lines -- and his Spectroscopy Laboratory developed an "automatic comparator," which allowed for high-speed measuring, computing, and recording of spectral wavelengths at the rate of a thousand per hour, some fifty times faster than previous methods. Slater and Compton also recruited Philip M. Morse, a theoretical physicist, who had co-authored the first American textbook on quantum mechanics. Mores also had a practical side. He was able to apply his thorough knowledge of wave behavior gained from his study of quantum mechanics to engineering problems in acoustics. He would in the coming years play a major role in MIT's war effort. In 1934, the Department hired Robley D. Evans, a young scientist who had begun studying the biological effects of radiation in the 1920s while a student at the California Institute of Technology and at the University of California, Berkeley. Evans established the new Radioactivity Center on campus where he did pioneering work in nuclear medicine and research into safety standards for radioactive materials. In 1938, Evans was responsible for organizing the building of MIT's first cyclotron, a particle accelerator that would be used to generate radioactive substances for medical research. 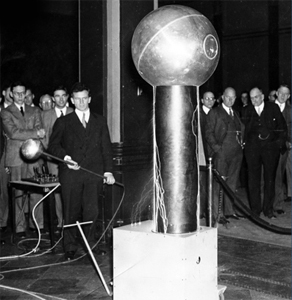 At an alumni meeting in the 1930s, Robert Van de Graaff (at left) wowed the crowed in the Hotel Statler with fully-working scale models of his eponymous generators and their display of electricity and sparks. From Princeton, Compton brought his colleague Robert Van de Graaff, an experimental physicist, who had developed an electrostatic generator that probed the inner workings of atoms. Compton recognized that this work could be, with the right resources, scaled up immensely. He sent Van de Graaff to Round Hill, South Dartmouth, a private research installation long affiliated with the Institute. There Van de Graaff built hulking, globe-topped generators capable of sending off electrical bolts and showers of sparks. The most massive of these, constructed in 1931 and dubbed the "Colossus of Volts," could generate up to 5 million volts of electricity and was large enough to host small laboratories in its domes spheres. By the end of the 1930s, Compton and Slater had begun the transformation of MIT into one of the country's top physics departments. But a war was looming in Europe and Asia, and the physicists in particular were beginning to think about how they could apply their knowledge and techniques to the coming conflict. Many suspected that physics would change war, but few would have guessed that war would change physics. On Compton's reforms to MIT and to Physics in particular, see: Stuart W. Leslie, The Cold War and American Science: The Military-Industrial-Academic Complex at MIT and Stanford (New York: Columbia University Press, 1993): 134-140; John W. Servos, "The Industrial Relations of Science: Chemical Engineering at MIT, 1900-1939," Isis 71, No. 4 (1980): 530-549; and Larry Owens, "MIT and the Federal 'Angel': Academic R&D and Federal-Private Cooperation before World War II," Isis 81 No. 2 (1990): 188-213. For detailed descriptions of different fields of investigation and work of various professors in the 1930s, see John C. Slater, "History of the MIT Physics Department, 1930-1948," unpublished m.s. , Box 171, Folder 1, Records of the Massachusetts Institute of Technology, Office of the President, 1930-1959 (A4), Institute Archives, MIT. For the period before 1930, see H.M. Goodwin, "The Department of Physics," in A History of the Departments of Chemistry and Physics at the M.I.T., 1865-1933 (Cambridge, Mass. : Technology Press, 1933). By the end of the 1930s, MIT's Physics Department was fortified with new recruits and more students, and the president of MIT was once again a physicist. As the Second World War loomed, the MIT community pledged its support to the Allied effort. For the physicists, this would manifest itself in two distinct ways: working on wartime projects away from and hosted at MIT, and aiding in the technical education of military officers so that they could fight effectively on the increasingly technical battlefield. World War II, which early on was labeled "the physicist's war," would change the nature of physics everywhere, and especially at MIT. 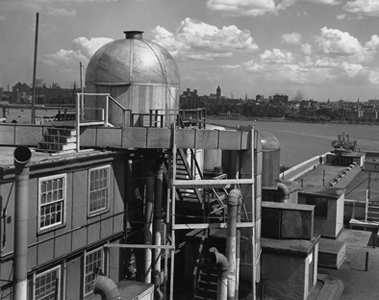 The dome of the Rad Lab's rooftop radar laboratory overlooks the Charles River. In 1940, a delegation of British scientists brought a new invention to the shores of the United States. The small and innocuous-looking radio tube known as a cavity magnetron had grown out of work the United Kingdom had been pursuing for years: to use reflected radio waves to detect planes and boats at a distance. It had become clear to the British that they would not be able to develop the technology alone in time to fight off the overwhelming airpower of the German Luftwaffe. 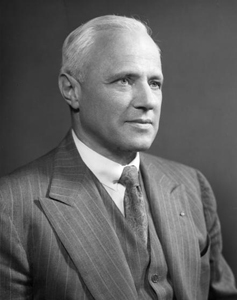 Karl Compton, President of MIT, had been involved in the American investigation into microwave research for defense purposes from very early on. Microwave research at MIT had been conducted since the 1930s, though it was not until the disclosure of the cavity magnetron to the Americans that the possibility of developing truly useful radar for use during war became realistic. 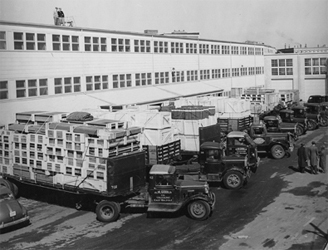 Trucks line up to deliver materials and remove radar sets at MIT's Building 20, home base for the Rad Lab. MIT was chosen as the site to host a new laboratory devoted specifically to radar research. Over the course of the war, the Radiation Laboratory at MIT (named as such to obscure its purpose from prying eyes) advanced and accelerated radar development, turning out new iterations of radar units with great speed, testing them first on the edge of the Charles River and later over the skies and seas of Europe and Asia. 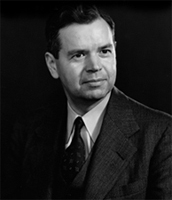 The head of the Physics Department, John C. Slater, made a great contribution to radar research when he was called upon to aid in the development of magnetron theory. His work contributed in the development of the x-band magnetron, an improvement on the cavity magnetron. Eventually the Rad Lab grew to have an annual budget of $13 million, a staff of over 4,000, and industrial contracts worth $1.5 billion; it was, as such, the single-largest war research laboratory. 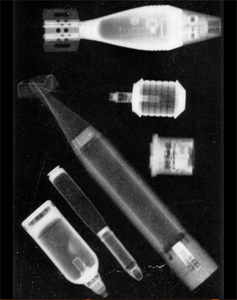 X-rays of captured Japanese munitions taken in Van de Graaff and Buechner's high-voltage laboratory during the war. Practically every member of the MIT Physics Department was involved in some form of war work. Robert Van de Graaff and William W. Buechner developed high-voltage x-ray machines that could be used to examine American castings and munitions for defects, and proved valuable for examining captured enemy munitions as well. The Radioactivity Laboratory, under Robley D. Evans, operated its cyclotron nearly twenty-four hours a day in order to generate radioisotopes for medical purposes. The Spectroscopy Laboratory run by George Harrison continued the analysis of chemicals it had begun in the 1930s, only for a new patron: the Manhattan Project, the top-secret crash program to build an atomic bomb. Department members worked on camouflage (specifically light-scattering paint that made daylight bombing raids safer), guided bombs and missiles, and noise reduction inside tanks. Philip M. Morse, whose experience in acoustics made him an expert on the latter issue, started his war work by developing hydrophones that could detect submarines for the Navy, and were quickly put into use in the field. He would later use this expertise to develop new strategies, based in a rigorous understanding of statistics, for tackling anti-submarine warfare. Morse's pioneering work in applying scientific methods to wartime strategic problems was the American equivalent of what was being called Operations Research in Britain, and became one of science's most far reaching contributions not only to World War II, but to warfare in general. 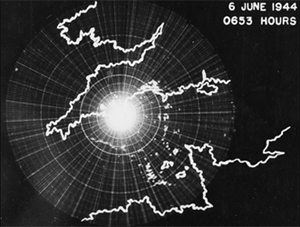 An MIT-produced radar scope shows Allied invasion of France across the English Channel on D-Day, 1944. It has often been said that while the atomic bomb ended the war, it was radar that won the war. Radar had grown to a crucial technology used daily in every theater of battle. Given this truism, as well as other wartime work done at MIT and by MIT affiliates, it is not an exaggeration to say that the Institute had a massive impact on the technical aspects of the Second World War. Physics in particular was given the lion's share of the credit for the success of the Allied forces, and World War II is often dubbed "the physicist's war." The war also changed MIT, and changed physics in particular. Some of the changes are obvious from the figures alone: in 1946, the total Institute annual budget was three times larger than the largest pre-war budget, of which half was devoted strictly to research. Some changes were more subtle. Whether in the massive factories and secretive laboratories of the Manhattan Project, or in the Rad Lab itself, MIT physicists were exposed to a new form of work where the line between pure research and applicable technology was impossibly blurred, where the resources at hand were incomparably larger than before, and where the government played an unprecedented role in the funding of research. For a readable account of the Rad Lab, see Daniel J. Kevles, The physicists: the history of a scientific community in modern America (New York: Knopf, 1977). For a detailed, definitive history of radar through the Second World War, including the Rad Lab, see Henry E. Guerlac, Radar in World War II (New York: American Institute of Physics, 1987). For accounts of non-radar related work at MIT and by MIT physicists, see John E. Burchard, Q.E.D. : MIT in World War II (New York: Technology Press, 1948); and John C. Slater, "History of the MIT Physics Department, 1930-1948," unpublished m.s. , Box 171, Folder 1, Records of the Massachusetts Institute of Technology, Office of the President, 1930-1959 (A4), Institute Archives, MIT. 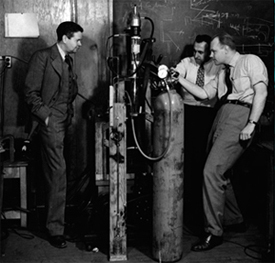 Department Chair John C. Slater (left) watches Associate Professor Melvin A. Herlin (right) and a technician in the low-temperature laboratories of the Research Laboratory of Electronics (RLE), 1949. The Second World War had a massive effect on the MIT Physics Department. The Department had already begun to grow into a major research wing under Karl Compton's presidency in the 1930s, but the expansion in students, faculty, and funding, it experienced then was minor compared to what happened in the years after the war. At MIT and elsewhere, research in physics shifted from the solitary pursuit it had been to a model based on the achievements of the Radiation Laboratory: groups of researchers given considerable freedom of investigation, in contact with one another to allow for maximal cross-fertilization, and with close connections between theorists, experimentalists, and engineers. Thus, when the Rad Lab was disbanded an independent, interdepartmental laboratory, the Research Laboratory of Electronics (RLE), headed by Julius A. Stratton, was created in its place. Though MIT had played host to the Rad Lab during the war, and had been able to recruit numerous new staff from it, it had not been a major participant in the Manhattan Project. Fortunately, however, one of the Department's new recruits from the Rad Lab -- Jerrold Zacharias, who had experience in both microwave physics and nuclear physics -- was sent to the secret Los Alamos laboratory for a few months just before the end of the war. While there, he was able to recruit a number of physicists to MIT who had not yet committed themselves elsewhere. Among those recruited were proven physicists like Bruno Rossi and Victor Weisskopf -- who had both played major roles in the bomb project -- as well as a dozen younger physicists. In order to consolidate and concentrate the Department's strengths in nuclear physics, another interdepartmental laboratory was created: the Laboratory for Nuclear Science and Engineering (LNSE), headed by Zacharias. MIT would become an international center not only for microwave physics, but for nuclear physics as well. After the launch of Sputnik, physics classrooms at MIT flooded with new students. 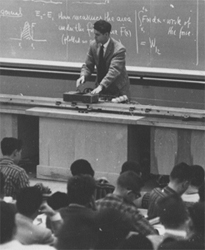 Here Associate Professor Uno Ingard lectures a crop of students at the Karl Compton Laboratories in 1958. Within a short time, the MIT Physics Department became unrivalled as the largest department in the country. Through much of the first half of the Cold War, more Ph.D.s in physics came from MIT than from any other institution in the country. In the mid-1950s, Physics was by far the largest department in the School of Science, with twice as many students and faculty as the Chemistry Department, three times as many as Math, and five times as many as Biology; on the whole it was responsible for almost 10% of all doctoral level degrees in physics in the country. In 1956 -- still a year before a second physics boom in the wake of the successful Sputnik launch by the USSR -- almost one out of every four freshmen entering MIT had indicated their intent to major in physics. The post-war growth in faculty and students was accompanied by new equipment and new machines. 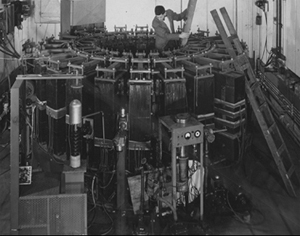 In 1950, a 300-MeV electron synchrotron and a 12-MeV electrostatic generator went into operation; in 1958, MIT had its own experimental nuclear reactor; in 1962, the joint Harvard-MIT electron synchrotron provided both universities with accelerator energies of up to 6-GeV. Each large machine pushed the barriers of research, while providing the tools for enhanced teaching capabilities of a next generation of physicists. Almost all of the funding that encouraged this growth came from the federal government in the form of defense contracts or National Science Foundation grants. Technicians inspect the 300 MeV electron synchrotron at the Laboratory for Nuclear Science and Engineering. During the early Cold War, MIT as a whole became the largest non-industrial defense contractor in the nation, and much of the funding went to its interdepartmental laboratories like the LNSE, the RLE, and Lincoln Laboratory (which grew out of the RLE, moving off campus in 1954). But most of the work done by physicists was not directed towards specific military goals. The defense funding was largely for fundamental research because it was recognized that scientists left to their own devices could often find useful things in unexpected places, and that simply having a well-funded and well-educated reserve of scientists on hand could prove useful in ways that could not always be anticipated. While physics had caught the eye of policymakers and the public as a whole, physics pedagogy at lower levels of education was viewed as rather weak by many scientists in the MIT Department. As the baby boomers became school-age children, public schools became flooded with new students while funds for teaching decreased. After the 1957 launch of the first artificial satellite, Sputnik, by the Soviet Union, policymakers and scientists alike worried that American scientific education was being outpaced, meaning that any technical advantage the US had developed during World War II would be ephemeral. 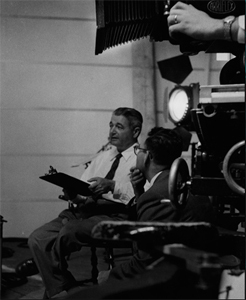 Jerrold Zacharias on the set, filming an installment in the Physical Science Study Committee's physics movies for high school students. The MIT Physics Department revised its own teaching methods and materials to included more of the modern physics that had revolutionized the field over the course of recent decades. MIT physicists then began to apply their pedagogical work outside of the Department as well. Jerrold Zacharias began by developing a series of physics demonstration films to be distributed to high schools. The films would not only show novel physics experiments, but also show physicists, not as white-haired savants but as regular, hard-working, inquisitive human beings. The NSF provided funding for Zacharias to launch a broader investigation into physics curricula, known as the Physical Science Study Committee (PSSC ), where Zacharias and a host of other physicists and scientists -- many of them from MIT -- would attempt to "solve" the problem of physics education in the United States. They quickly realized that films alone would not be sufficient, and instead ended up developing an entire set of course materials including a textbook (of which over a million copies were eventually produced), a teacher's guide, and a set of recommend experiments. The PSSC curriculum would, in the 1960s, be distributed across the country, and become a major part of many high school students' educational experience. For a bare-bones account of the 1930-1948 period from the point of view of the department head, see John C. Slater, "History of the MIT Physics Department, 1930-1948," unpublished m.s. , Box 171, Folder 1, Records of the Massachusetts Institute of Technology, Office of the President, 1930-1959 (A4), Institute Archives, MIT. For accounts of the use of federal funding at MIT in the Cold War, see Silvan S. Schweber, "The Mutual Embrace of Science and the Military: ONR and the Growth of Physics in the United States after World War II," in Everett Mendelsohn, Merritt Roe Smith, and Peter Weingart, Science Technology and the Military, vol. 1 (Boston: Kluwer Academic Publishers, 1988): 3-45; and Stuart W. Leslie, The Cold War and American Science: The Military-Industrial-Academic Complex at MIT and Stanford (New York: Columbia University Press, 1993). For the account of the boom-and-bust of physics Ph.D.s in the Cold War, see David Kaiser, "Cold War requisitions, scientific manpower, and the production of American physicists after World War II," Historical Studies in the Physical and Biological Sciences 33, no. 1 (2002): 131-159. For the definitive account of Zacharias and the Physical Science Study Committee, see John L. Rudolph, Scientists in the Classroom: The Cold War Reconstruction of American Science Education (New York: Palgrave, 2002). 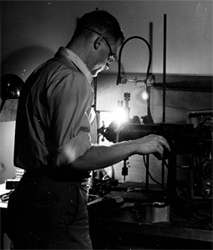 Henry W. Kendall, shown here as a graduate student at MIT experimenting with high intensity microwave excited glow discharge. Years later he would win, along with Jerome I. Friedman, the 1990 Nobel Prize in Physics. The 1970s and early 1980s were a difficult time for physics in the United States as other areas of science blossomed, in particular modern molecular biology. MIT was not exempt from the burst of the physics bubble, but it weathered it extremely well. Though it faced a drop-off in enrollments, awarded degrees, and faculty members from its Sputnik-era levels, it was able to maintain a large measure of stability in its overall activities, and did much better in terms of numbers of graduates than did the physics discipline as a whole. Throughout this period, MIT remained one of the top-ranked physics departments in the country, both in terms of education and research. One of the factors behind its stability was the tradition of interdepartmental laboratories developed after the Second World War. By the 1990s, MIT Physics personnel were prominently involved in at least eight separate interdepartmental labs: the Laboratory for Nuclear Science (LNS), the Research Laboratory of Electronics (RLE), the Bates Linear Accelerator Center, the Center for Materials Science and Engineering (CMSE), the Center for Space Research (now Kavli Institute for Astrophysics and Space Research), the Plasma Science and Fusion Center (PSFC), the Harrison Spectroscopy Laboratory, and the Haystack Observatory. Samuel C.C. Ting along with a data proving the existence of the new 'J' particle, the work for which he shared the 1976 Nobel Prize in Physics. During its history, over twenty-five Nobel Laureates for Physics have had connections to MIT as alumni (including Richard Feynman, William Shockley, Murray Gell-Mann, John Robert Schrieffer, Burton Richter, Henry M. Kendall,William D. Phillips, Robert B. Laughlin, Eric Cornell, Carl E. Wieman, and George Smoot), as faculty (including Samuel C.C. Ting, Steven Weinberg, Jerome I. Friedman, Clifford G. Shull, Wolfgang Ketterle, and Frank Wilczek), or as Radiation Laboratory employees (I.I. Rabi, Edwin M. McMillan, Edward M. Purcell, Julian Schwinger, Hans Bethe, Luis W. Alvarez, and Norman. F. Ramsey). Four Nobelists received their prizes for work done while on the MIT faculty. The first two were Jerome I. Friedman and Henry W. Kendall. Friedman joined the MIT Physics Department in 1960, working at the Harvard-MIT electron synchrotron, testing the validity of quantum electrodynamics; Kendall, who had been a MIT Physics graduate student in the 1950s, joined the faculty in 1961 and became a part of Friedman's research group. Using the brand-new accelerator at the Stanford Linear Accelerator Center (SLAC), in 1967-1968, they used a stream of accelerated electrons to prove that protons were made up of tiny particles, later identified as quarks. For this work, Friedman, Kendall, and the Stanford physicist Richard E. Taylor were jointly awarded the 1990 Nobel Prize in Physics. MIT physicist Wolfgang Ketterle, co-winner of the 2001 Nobel Prize in Physics, was one of the first in the world to create a new state of matter, the Bose-Einstein Condensate, and to probe its properties. The third Nobelist whose prize came from work done while on the faculty at MIT was Samuel C.C. 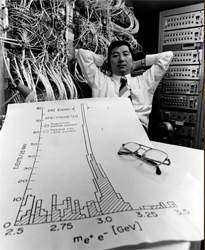 Ting, who had come to MIT in 1969. In 1974, Ting's group used the Alternating Gradient Synchrotron at Brookhaven National Laboratory to discover a new subatomic particle, which Ting dubbed the "J" particle, consisting of a charm quark paired with a charm anti-quark. The same particle was also independently discovered just a bit later by a group at the Stanford Linear Accelerator Center led by MIT Physics alumni Burton Richter (who called it the "psi" particle; today it is known as the "J/psi" particle). These dual discoveries of a new particle provided the first confirmation of the existence of one of the six "flavors" of quarks, the charm quark. For this work, Ting and Richter shared the 1976 Nobel Prize in Physics. The fourth Nobelist whose winning work was completed while he was working at MIT was Wolfgang Ketterle. Ketterle had arrived at MIT in 1990 as a postdoctoral student working for David E. Pritchard. 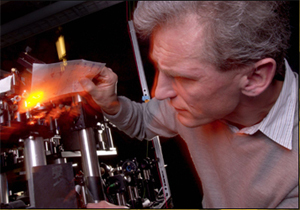 Ketterle was appointed as assistant professor in 1993 and developed new ways to make clouds of ultra-cold atoms at a relatively high density. Two years later, Ketterle's team manage to produce an elusive state of matter known as the Bose-Einstein Condensate (BEC). Frank Wilczek waited over 30 years to receive the Nobel Prize for his theoretical work. The possibility of the BEC had been predicted by Albert Einstein and Satyendra Nath Bose seventy years earlier. In a BEC,the atoms lose their individual identities and behave in a cooperative, wave-like manner, similar to the way that light particles behave in a laser. The first creation of a BEC had been done just a few months before Ketterle's team produced it -- by a team working independently at the University of Colorado, Boulder, led by Eric Cornell and Carl E. Wieman (both MIT Physics alumni) -- but Ketterle's method allowed for a greater number of atoms made into the BEC, and thus allowed for the observation of a wider range of associated phenomena and possible applications. For their work on Bose-Einstein Condensates, and their early studies into their behavior and composition, Ketterle, Cornell, and Wieman jointly shared the 2001 Nobel Prize in Physics. Another Nobelist received his prize while on the MIT faculty though the work itself had been done prior to coming to MIT. 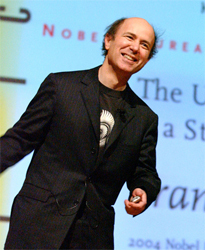 Frank Wilczek came to the MIT Physics Department in 2000, but had begun his prize-winning work in 1972. In short, Wilczek and his advisor at Princeton University, David Gross, discovered asymptotic freedom, a theoretical concept meaning that quarks -- the fundamental particles that make up protons and many other particles -- have less nuclear force the closer they are. This proved to be an important and useful concept, becoming a cornerstone of the sub-discipline known as quantum chromodynamics. Wilczek, Gross, and H. David Politzer (who independently discovered the same concept) were awarded the 2004 Nobel Prize in Physics; in the intervening years, Wilczek further developed his reputation as a shrewd theoretical physicist with diverse research interests. 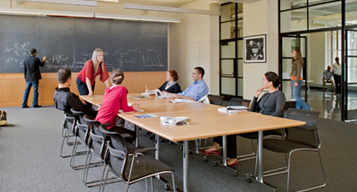 Photo of students in the Pappalardo Community Room, one of the many rooms of the Green Center, which will bring together the MIT physics community as a site for collaboration and research. By the year 2000, the Physics Department was spread over 13 buildings on campus. The Green Center for Physics was conceived to bring together many of these activities in a central location. With the inclusion of the department headquarters and teaching support services, the Green Center is also a place where faculty from the remaining buildings are certain to meet and interact. The creation of the Green Center for Physics guarantees that the proud tradition of MIT Physics will extend into the twenty-first century, providing a stage for new frontiers of research and continuing excellence in education. For information about the MIT Physics Nobel Prizes, their own official Nobel speeches and autobiographies have been most helpful. Statistics on the department's enrollments and degrees compiled from the annual Reports to the President; they have been compared against statistics on the discipline as a whole retrieved from the American Institute of Physics.